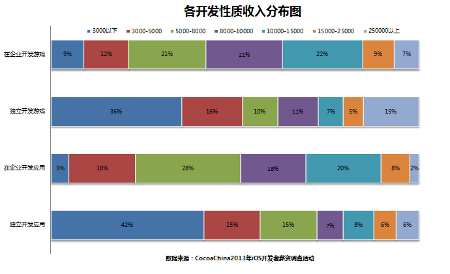 A report said that half of iOS developers in China already have gotten more than 1,300 USD salary. The apple engineer forum "CocoaChina" published a factual investigation about iOS developers in China. 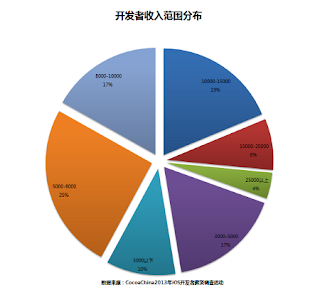 And this report said that half of iOS developers in China already have gotten more than 1,300 USD (= 8,000 RMB) salary. I think that 1,300 USD (= 8,000 RMB) is a division point in this report, because both range each have about 50% share. And the following graph is a breakdown of the above graph, and this graph divided developers into 4 types ( Corporate games developer, Personal games developer, Corporate apps developer and Personal apps developer). The both types of corporate developers who are Getting less than 480 USD salary are less than the total average. And about the corporate developers, the percentage of who are getting more than 1,300 USD salary are more than the total average (Corporate apps developer - 48% ; Corporate games developer - 59%). According to the news, the average salary in the urban areas of China is about 631.7 USD in 2012, and this was 11.9% increased compared to 2011. There is not a time series data in this report, but I think that the salary of iOS developers is increasing more rapidly than the average. In China, Android is a main device as a using device, but a lot of companies have outsourced developing iOS apps or games to China. So the needs of iOS developers are also increasing day by day in China. We have to pay close attention to the future trends of this.